What are you giving this season? It's the giving season. Thanksgiving is this Thursday and then we slide downhill, gathering speed and steam, into Christmas and the new year. Some might tell you to remember to be grateful and share your gratitude with others, but really, isn't that somewhat trite? Gratitude shouldn't be evident only in November. It should be a year-round practice. Others might tell you to slow down and enjoy the season, your friends, and family. This is also good advice; but from experience, I know that doesn't always seem possible. It is, but depending on your age, you may not have figured that out just yet. There are some who wish for expensive toys, gadgets and trinkets and others who struggle to deliver those wishes to everyone on their Christmas list. And there are some who are sad because of many reasons. It seems that the holiday season can bring out the best and the worst in all of us. That is why I encourage simplicity and optimism at this time of year. One simple statement will allow you to give the gift of yourself to all you meet. What is it? You can celebrate every season, not just the holiday season, when you start every day with a smile. 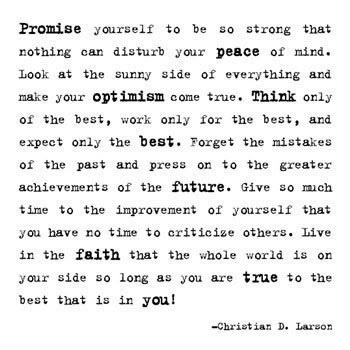 Click here to enjoy the full Optimist Creed.